I think everyone is familiar with the sharp, fresh aroma of Eucalyptus Oil. Although it is more commonly used in decongestants , mouthwashes and toothpaste, it can also be useful in skin care. Be sure to read the caution section at the end of this page. Although it is useful when caring for your skin naturally, there are some people who should not use it. 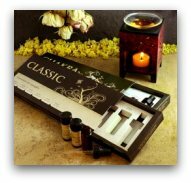 Origin and Description:This essential oil is derived from the Eucalyptus Tree which is native to Australia. The Eucalyptus tree is an evergreen that can grow up to 300 feet tall, has tough, long, greenish blue leaves and is one of the fastest growing trees there are. It has been used for thousands of years to heal wounds and treat skin infections. Part of Plant Used: Oil is steam distilled from fresh or dried Eucalyptus leaves. Aroma: Quite strong and sharp with a fresh almost medicinal, woody smell. Skin Care Uses and Benefits: Eucalyptus is used in lotions and creams for its antibacterial, anti inflammatory and astringent properties. It can be used to treat burns, rashes, skin infections, boils, cold sores and insect bites. A couple of drops in your bath is also helpful for a stuffy nose or bronchitus not to mention the very uplifting aroma. Eucalyptus essential oil blends well with these essential oils: Thyme, Lavender, Lemon Grass, Lemon and Pine. Cautions: Do not use if you are pregnant, have low blood pressure, epilepsy or asthma. Eucalyptus is toxic if ingested and should never be used undiluted. Do not use in combination with Comfrey, Butterbur and Borage. Always consult with your doctor if you are not sure.